Yesterday I received Ski Magazines issue rating ski resorts. It was interesting to compare my own impressions of the various resorts I had skied at with the ratings by the magazine. I think that every skier has a different set of criteria for ski resort that best meet their needs. The most important thing for me is lots of good snow with enough groomers to give me some relief and a variety of terrain and scenery to enjoy at my leisure. 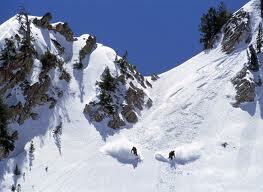 I was pleased to find that if you are looking for the best snow Utah is the place to go. I certainly agree with the raters on that one. After skiing Alta, Snowbird and Snowbasin last year I have no doubt they have the greatest snow on earth. And for the geezers, Snowbasin has it all. It is notable that Snowbasin has the highest rank for food service and I totally agree with that. In the East I really enjoy Mad River Glen as well as Okemo though overall they do not rank as high as some of the other resorts. Mad River Glen is great skiing at at a reasonable cost where the emphasis is on being a great skier in a dedicated family oriented setting. Okemo is great for groomers and service. In the By the Numbers page of the Fall 2010 issue of Ski Magazine I note that New York State has the most ski resorts of any state at 48. With 473 resorts in the U.S. that means New York has over 10 percent of the ski areas in the nation. I have skied at eight of the New York areas so far. I think I will put it on my bucket list to ski all the areas in New York State. It could be interesting! Looking forward to the the 2010-2011 season. Here's to an early start in upstate New York!! Happy skiing everyone wherever it may be.